Yggdrasil is the band of Gustaf Hagel and Magnus Wolfheart from Sweden. They begun this project on 2001 and after various demos they signed with Det Germanske Folket to release their debut “Kvällningsvindar över Nordrönt Land” in 2007. Two years later they return with the same label to offer us their second effort “Vedergällning”, a really good album. Listening to this new album is like listening to a new band. The sound improvement is chaotic! Another difference is that the female vocals that were used in their previous album are now absent. “Vedergällning” has a very epic sound, created by the mid-tempo heavy riffing and the folk tunes of the lead guitars. The use of enchanting violins works excellent in this album and it actually gives this “something” to the songs. Synths are mainly in the background, in order to add some “depth” in their sound, while some acoustic instruments (mostly guitars) help them to create a magical folk atmosphere. Vocals are also improved and except for the typical pagan black metal screams, there are also male clean vocals and many epic choirs, especially in the refrains. All of them are combined in perfect balance, following the spirit and atmosphere of the music. There are 8 songs in total in this album that last for almost 45 minutes and all of them are based on the characteristic traditional Norse scales that many bands before them have introduced. 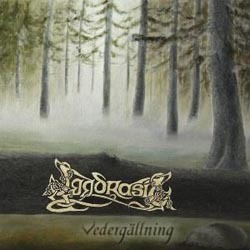 But Yggdrasil are far from copying other bands and “Vedergällning” has a very personal sound, with excellent work in the compositions. Their lyrics are in Swedish and as expected they deal with themes from the Norse mythology / history. Yggdrasil are back with a great folk metal album. Their rich sound with the melodic refrains, the epic choirs and the folk violins are simply amazing and worth the attention of fans of the genre. Especially because it’s obvious that the band put a lot of effort in this work, in order to achieve this surprising improvement. You can visit their official pages to listen to songs from both their albums and find more info about this great folk band.